Everyone loves a bargain - but Connie Ortiz gets more than she bargained for when she buys an old cuckoo clock at a yard sale. Suddenly, strange people begin entering her life. An elderly man appears at her doorstep, offering to buy the clock. The older lady in charge of the sale urges Connie to keep the clock at all cost. And her handsome boss arrives on the scene to play referee. Truth be told, Lance Adams cares less about refereeing than he does getting to know Connie. He finds her quite intriguing - but so, too, is her fascination with a clock that everyone seems to want. What is it about this clock that has people in a frenzy? Can love resolve this mystery? Only time will tell. Fall in love with this inspiring love story and our entire collection of Christian romance novels from Heartsong Presents! 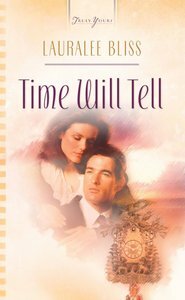 About "Time Will Tell (Heartsong Series)"